One year ago I predicted that the blog post with the most hits in 2016 would once again be about Venezuela. This turned out to be correct, but not in the way I thought. The most popular post was comparing Hugo Chávez to Donald Trump from July. Number two was also about Venezuela, but focused on George Kennan--I'm not really sure how such a little known historical figure got that kind of attention. Number three was my discussion of Obama's problematic immigration record. For 2017 my guess is that the most popular post will be something about Donald Trump. As I did last year, it's worth mentioning the reader interest in book reviews, which I'm always pleased about. In particular, people clicked to read more about Tom Long's Latin America Confronts the United States and Russell Crandall's The Salvador Option. I recorded 18 podcasts this year and will keep doing those in 2017, once a week if at all possible. If you are interested in doing one with me, just let me know. In Episode 18 of Understanding Latin American Politics: The Podcast, I talk with Miguel Centellas, who is Croft Instructional Assistant Professor of Sociology at the University of Mississippi. His research focuses on political institutions in new democracies, and he’s done a lot of work on Bolivia. We talked about how electoral rules have affected political stability, what’s up with the opposition, and the question of Evo Morales trying for another presidential term. BTW, he also plugs his very cool Bolivia study abroad program. Click here for more info. These same industries contend that stricter immigration enforcement will further shrink the pool of workers and raise their wages. They argue that closing our borders to inexpensive foreign labor will force employers to add benefits and improve workplace conditions to attract and keep workers already here. Actually, no, they're not complaining about having to raise wages. They're concerned that no one will want to work there at all. In the 21st century, I don't see evidence that non-immigrants want to move seasonally with the harvests. That's why a guest worker program makes sense. Some years ago, I reviewed Gabriel Thompson's excellent book Working in the Shadows. The work our economy needs people to do is brutal, and not something anyone wants to do long-term. This is an unpleasant reality, but we have to be conscious of it. If you greatly restrict labor supply, the most likely outcome is bankruptcies, accompanied by prices shooting up. Let me put this another way. Trump voters do not think that "making America great again" involves them picking lettuce. Mauricio Macri fired his Finance Minister because the Argentine economy is still struggling. Inflation is forecast to rise to around 40% in 2016, while the economy is expected to contract by 2%, according to the International Monetary Fund. In 2015, Argentina’s economy grew 1.2%, the IMF said. Of course cabinet members are famously scapegoated, but wanting fast results is problematic. The Kirchners were in office a long time and so change either has to be gradual or destructive. Argentina already tried the destructive kind and it led to...the Kirchners. The wanting fast results then gets back to promising fast results, whether you believed your own promises or not. Macri was to going to "build concrete things" and Argentina would have a "happiness revolution." Economic contract is not particularly happy. After years of thinking about doing so, I read David Foster Wallace's Infinite Jest. After starting it, my immediate strong impression was that he was unbelievably intelligent. The book is chock full of words I've never heard of, and loaded with detailed descriptions of drugs and other things (even mathematical equations) that are absurdly minute. * It goes all over the place, but the main settings are a halfway house and a tennis academy, situated near each other in the Boston area. My other immediate impression was that he was incredibly funny. Laugh out loud funny, even, as he probes every kind of character you can think of, from the president to a junkie. Yet that goes side by side with occasionally really twisted narrative about human beings abusing each other and themselves. Then they get mixed, like someone committing suicide by putting their head in a microwave oven. But as they say, I digress. It's a book about addiction, but substances vary. There is the traditional cocaine-type, but the book's title revolves around entertainment (called Infinite Jest) that's so pleasure-inducing that you can't tear yourself away and so you just die. It's so powerful that terrorists (Canadians, actually!) want to get hold of it. The theme is that people are too willing to avoid "real" life in favor of easily digestible mind-altering substances that actually ruin your life. Overall, it's not an optimistic view of the human condition. One of the most compelling parts for me was the almost anthropological details of Alcoholics Anonymous meetings. It sounds cliche, but he puts you right there, from constantly shifting, but clear characters. I will probably think about this book anytime the topic of addiction comes up. Really, the book is anthropology. He can describe everything, and put you everywhere, a street-smart intellectual. But let's face it, it's a hard book to read. Of course, to start with it is over 1,000 pages. There is no plot, he jumps around in time, there are extensive endnotes at the back, which sometimes just meander, and sometimes it's hard even to know what's going on. You really have to want to read it. You won't forget it if you do. * No, I don't mean putting in an endnote as a pun because of the heavily endnoted novel, but I wanted to point out there is an Infinite Jest Wiki, which deconstructs it page by page. As I've written a number of times, Bolivia tends to fly under the radar with regard to economic policy. Evo Morales uses very strong anti-imperialist, anti-U.S., and pro-populist rhetoric, but he makes economic decisions in a conservative manner. That's the upshot of an IMF article on the challenge of low commodity prices for Bolivia, which is pretty much glowing. A self-proclaimed socialist is receiving praise for "sound policies" by the IMF. It is testament to the successes of the Evo Morales government, which has made lots of people forget how horribly and chronically unstable Bolivia was not long ago. It also made me think that now the time should be ripe to step down and let someone else deal with future challenges. But he seems not to like the idea of letting anyone else govern. If he manages to stay in power amidst an extended period of low commodity prices, then watch for those approval ratings to start plummeting. The Heritage Foundation just published an economic analysis of Latin America. I'd say most people would agree with a big chunk of it--for example, Latin America suffers from corruption and government interference in the financial system. Being the Heritage Foundation, however, it comes back to a single factor, "economic freedom," as the cure of all ills. I know, I know, this is what the Heritage Foundation does. But especially at a time when the Trump administration will likely be looking there for appointees, it's worth pointing out the drawbacks to this approach. The irony, of course, is that this "cure" is exactly what led to many past ills. We went down this road of economic freedom in the 1980s and into the 1990s, and the backlash led to Hugo Chávez and regional efforts at populism. After many Latin American countries rejected the economic models of authoritarian dictatorships in the 20th century, they too often lurched to the opposite extreme and embraced socialist and populist varieties of authoritarianism and even totalitarianism marked by the same fatal flaws in the 21st century. Actually, no. They rushed into market solutions that ultimately led to revolts, hence the "lurch." The report does not mention inequality at all, and just barely mentions dependence on commodity exports. If you focus almost entirely on GDP as they do, then you ignore both the human reality and the structural constraints that exist. You can have all the economic freedom you want, but if you rely on commodities, then when prices drop you're screwed. In Episode 17 of Understanding Latin American Politics: The Podcast, I talk to myself. Or rather I talk to you about the most momentous moments of 2016 in Latin America, or at least those that have interested me in particular. My main criterion is that they had to affect not just the country but also the region. Quibbling is expected. Brazilian construction firm Odebrecht and petrochemical company Braskem pled guilty to bribery in U.S. court and now must pay $3.5 billion in penalties. 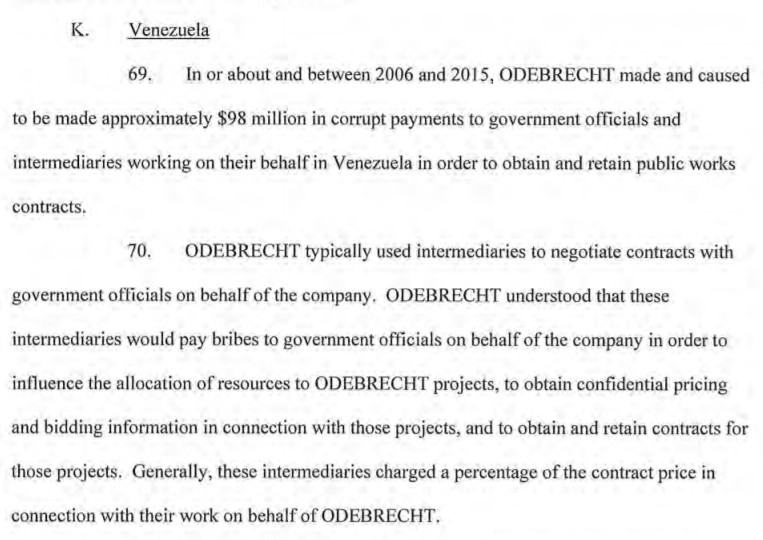 From 2001 to 2016, Odebrecht paid approximately $788 million in bribes in association with 100 projects in 12 countries, including Brazil, Argentina, Colombia, Mexico and Venezuela, according to the U.S. charging papers. The companies hid the bribes through carefully disguised payments routed through a network of shell companies as well as suitcases of cash left at preset locations, Suh said. In the digital age, we still have the oldie but goodie suitcase full of cash. If you're interested, here are the charging papers. Take a wild guess about which Latin American country received by far the most bribe money. Surprise, surprise, it's Venezuela. There is no doubt, of course, that these funds made their way directly to Hugo Chávez and his associates, which helps account for why so many of the latter are fabulously wealthy. There is no way that this case is the only one in existence either. I assume Nicolás Maduro will label it a conspiracy. This is going to shake out over the coming months, in conjunction with other corruption revelations, like the Panama Papers. Kudos to the Justice Department. Let's hope the professionals are allowed to continue their work despite the change of administration. Frank Mora has a pessimistic view of Cuba policy under Donald Trump. But beyond campaign/transition promises or appointments, the reason Mr. Trump is likely to fulfill his promises is that, in the end, he really does not care about Cuba or democracy. Through the campaign and the transition period, he has consistently shown a willingness to sacrifice national interests and policy effectiveness for transactional domestic politics. I have leaned a bit the other way, because of a point Frank acknowledges but thinks won't hold out. After the election, some of those trying to read the crystal ball of Trump’s intentions toward Cuba argued that Trump is ultimately a pragmatic businessman and that he would, in the end, soften his stance. After all, the argument goes, reversing policy would adversely affect business deals and other benefits for businesses and people on both sides of the Florida Straits, deals that are thought to total more than $5 billion. I have tended to think that Trump will roll back some things but leaves plenty others in place. More specifically, for example, he could tighten up who is allowed to travel (right now you cannot go as a tourist but you can get awfully close to tourism). So Trump could make a lot of noise about blocking tourism to the Castro government, while not significantly cutting into the business already being done there. I tend to see this as a transactional sort of arrangement that Trump might like. However, it is true that over the past six months or so his rhetoric has been pretty solidly hardline. On the other hand, he easily moves away from hardline positions even as he pretends still to adhere to them. On the other, other hand, he wants to keep the support of the small but very vocal Cuban American hardliners. At this point there are too many hands. We have to wait for January 20. The U.S. government just released newly declassified documents related to Operation Condor, which come after President Obama's visit to Argentina earlier this year. The National Security Archive has a sampling. There is no sugar coating it--the documents show how much the U.S. knew about Latin American military governments finding targets for assassination, including NGOs. As more documents find the light of day, the scope of how bloodthirsty the Condor architects were keeps expanding. The complicity of Henry Kissinger cozying up to the Argentine junta also becomes ever more disgusting. If you're interested in more detail, check out my review of Fernando López's new book on Condor. The MAS party in Bolivia has nominated Evo Morales for a fourth term for the 2019 presidential elections, and he has accepted. You might ask how this is possible given that he lost a referendum about whether he should be allowed to run again. The answer is that you can mess with the constitution. Apparently one suggested route is the transparently ridiculous notion of simply resigning before the third term is over and proclaim that somehow it shouldn't be counted as the third. This is extremely early to announce a candidacy and I suppose could be seen either as a trial balloon or just paving the way early for constitutional chicanery. Either way there is plenty of time to figure out a good way to back off and safe face. It should go without saying that these sorts of machinations damage democracy. Bolivians announced they did not want presidents to have more terms, and the president should not ignore that. Further, no president should ever feel indispensable, which inevitably leads to abuse of power. Democracy needs alternation of power. Both Michelle Bachelet and Cristina Fernández are examples of this. Instead, too often one party feels it must maintain its grip on power no matter what. I'm quoted in this article about Cuba policy. Specifically with regard to human rights, the question is whether normalization of relations matters. Hardliners believe that the regime is being rewarded without making any concessions. As is noted in the article, I understand that argument but I think it misses the point. We know the embargo and other restrictions had no impact on human rights in Cuba. If anything they helped entrench the regime. Normalizing is not likely to make the human rights situation worse, and at least gives the U.S. a little more leverage to push the Cuban government. At a minimum, if a policy has clearly failed to achieve its objective for 50+ years, it's worth trying something else. The further point of the article is that if Trump rolls back what Obama has done, we're back to a poor human rights record and no leverage. It's not clear to me how that benefits anyone, except maybe the Cuban government. I read Juan Pablo Villalobos' I'll Sell You a Dog, the madcap style of which is very similar to his previous novel Quesadillas, which I read last year. It's less dark, though, as it chronicles an old man named Teo who lives in a building in Mexico City with other older people, all of whom incorrectly think he is a novelist when in fact he is retired from running a street taco stand. This is what structures the narrative, as he drinks and tries to figure out how to disabuse them of this idea. The dog narrative is almost incidental (and kinda gross) to a funny group of characters, including a young American Mormon who lamely tries to convert Teo and cockroaches that move when you play Cuban music. The story gets sewn up at the end in a manner that gets rather close to a cliche but is an enjoyable read nonetheless. In Episode 16 of Understanding Latin American Politics: The Podcast I talked to Dinorah Azpuru, Associate Professor of Political Science at Wichita State University, about public opinion in Latin America. Among other things, the conversation focuses on attitudes toward democracy, attitudes in Guatemala (she is originally from there and has done a lot of research on it) and perceptions of U.S. influence in Latin America. In the UK you can bet on which country Donald Trump will visit first. I don't know who would bet on a trip to Cuba or Venezuela (not to mention North Korea!). I guess you would take the risk on the small chance (though I think much smaller than the odds given) that somehow there is a radical change of government between now and whenever Trump makes his first trip after inauguration. Check out this study from the Johns Hopkins Institute for Applied Economics, Global Health, and Study of Business Enterprise by two economists explaining the technical reasons we can say that Venezuela has entered a state of hyperinflation. They define is not only as 50% inflation per month, but persisting for at least 30 days, and the estimates had to be replicable. There are only 56 such instances recorded. Venezuela reached this state nine days ago (December 3, 2016). The lack of official data makes it trickier for Venezuela. Indeed, what mismanaged government wants to make it easier to say there is hyperinflation? Venezuela, welcome to the record books. You have now entered the inglorious sphere of hyperinflation. It is a world of economic chaos, wrenching poverty, and death. Its purveyors should be incarcerated, and the keys should be thrown away. The Washington Post has an interview with Peruvian President Pedro Pablo Kucznyski. These days he's one of the few Latin American leaders speaking out on a regular basis--too many others seem too embattled to do so. This means he's getting more of a voice in the U.S. than a Peruvian president otherwise might have. I don't have any idea whether he's influential in the region or not (or how representative his views are). On Trump: "If they think that Latin America is just a bunch of guys who climb walls to get illegal work, then it is not going to go well. I hope they go past that." On Maduro: "Maduro is afraid that if he yields, they will hang him from a lamppost, so he wants to stick with it." On China: "I don’t love TPP so much. China is our biggest customer. So how can we support something that excludes them?" On mine protests in Peru: "I’m not like past presidents. None of them actually went to talk to the miners." Mexico's top military officer said Thursday that the army is uncomfortable with the law-enforcement role it was given a decade ago when the government launched an offensive against drug cartels. The defense secretary, Gen. Salvador Cienfuegos, said the army's presence was supposed to be temporary while new police forces were built, but that hasn't happened. It's a lose-lose situation for the army. It becomes a target, becomes guilty of human rights violations, and looks worse to the Mexican people. This is a serious indictment of the government, which simply cannot do what it takes reform the police. Of course, it's also an indication of how deep corruption is in Mexico. 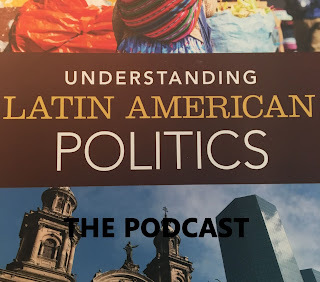 In Episode 15 of Understanding Latin American Politics: The Podcast, I talk to Luis Schenoni, a Political Science Ph.D. student at the University of Notre Dame (check out his website here). We discuss the relationship between Latin America and China. He just published an article in Latin American Politics & Society (sorry, gated) on the topic as well as a piece in The Monkey Cage. Interesting stuff. Nice post at CIPER Chile looks at the personal fortune that Chilean dictator Augusto Pinochet amassed over his years in power. 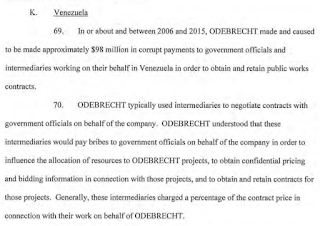 The current estimate is at $28 million obtained illegally, which means using state resources for personal gain. This doesn't include money gained by his family members. There is a entire web of corruption. Pinochet always maintained that he was different because he was just doing what was right for the country and did not seek personal gain. Therefore he wasn't a Ferdinand Marcos or Anastasio Somoza. Yet he was. When you have unfettered access to state money, you're going to steal it. Maybe be even more wary of those who claim to have a halo over their heads. Rep. Michael McCaul (R-TX) published an op-ed about forcing Mexico to pay for increased border security, including more wall. It is mostly boilerplate xenophobia, but it's worth noting the sense of how Latin America itself is deficient. That is why I’m proposing we put Mexico on a “payment plan” and fulfill President-Elect Trump’s demand that our allies help resolve this mess. There are many reasonable ways to do this. For starters, we can put in place new immigration fees from Mexico, institute a security toll at border crossings, “seize and freeze” drug cartel assets, and more. But it shouldn’t be limited to Mexico. Other countries in Latin America have contributed to the crisis—and failed to rein in the chaos—so they should also help pay for these fixes, too. Sadly, there is no learning from history and no recognition of the U.S. role in the origins of "chaos." Worse, the attitude is that if countries are punished financially, they will become more effective and prosperous. I am not at all sure how that logic works. As Mike Allison recently noted, Donald Trump has not mentioned Central America. If he follows the punitive approach, then we could see even worse economic (and therefore also immigration) problems in the future. I attended an interesting talk by Carlos Alzuguray, a prominent Cuban scholar and diplomat. He argued that Fidel Castro's death will be a turning point for change in Cuba, since his presence greatly slowed changes even though he was no longer in government. It was a frank talk. He said the economy clearly was not working and that once Raul was gone, the new leaders would inherit a "papa caliente." Not only are there severe economic problems, but the new leadership will not share the same mantle of legitimacy that the founders of the revolution enjoyed. He also said that it had been a mistake not to work harder to expand internet access, noting that this is where Cuban entrepreneurs had a lot of untapped potential. It struck me that an unknown question is that once Raul is gone, how well will the new leaders cooperate? We see how Hugo Chavez held together disparate factions, which fought harder against each other once he was gone. Cuba will have its own internal schisms about how to move forward, and we don't know how those conflicts will play themselves out.